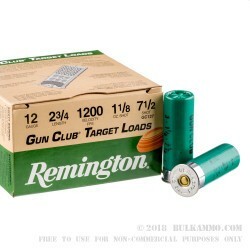 Remington offers their line of Gun Club Target Loads ammunition to shooting enthusiasts who would like to see great performance out of their shells without having to make their wallets work hard too. With its Gun Club grade shot, Premier STS primer, and Power Piston one-piece combination shot cup and wad column, this shell may get you closer to 25 at trap than you’ve ever gotten before. Furthermore, because it has a steel base rather than a brass one, it pairs nicely with a magnetic shot holder. 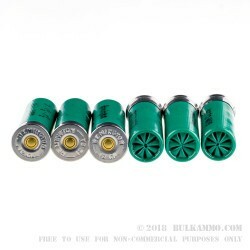 This 12 Gauge shell contains 1 ⅛ ounces of #7.5 lead shot. 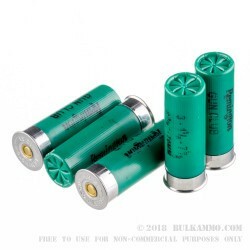 If that’s your shot size of choice for pleasant or other avian game, training with this shell will hone your snapshot skills nicely. It’s hard to go wrong when it comes to Remington, an American company that’s been in the shooting business for over 200 years.